Another thing I love about fajitas is that they’re so customizable. We make a very basic meat mixture, which contains the perfect amount of spice for the kids’ palates, and then we can spice up the adult portions by adding a salsa with more heat. Serve the fajitas with your favorite tortillas or as a fajita bowl over a bed of shredded lettuce. In a gallon-size plastic freezer bag, combine steak, peppers, onion, and seasonings. Place tortillas in another gallon-size plastic freezer bag. Place any optional toppings (sour cream, salsa, cheese, green onions) each in a separate sandwich-size freezer bag. 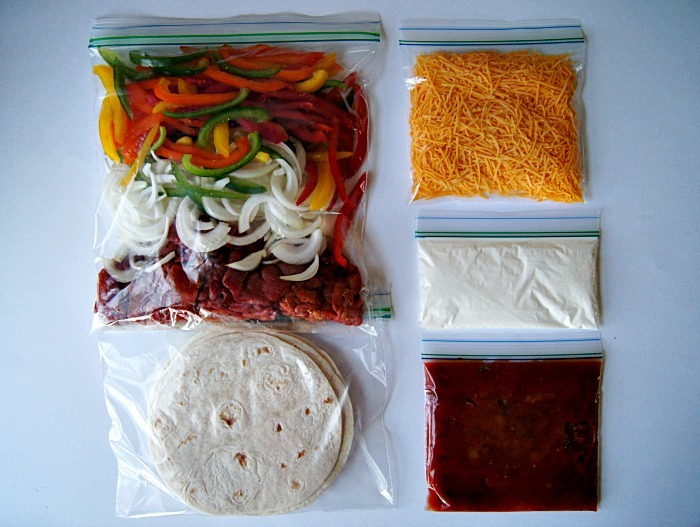 When ready to serve the fajitas, thaw bag(s) in the refrigerator, preferably overnight. Heat olive oil in a large skillet over medium-high heat. Add contents of steak, pepper, and onion bag into the skillet; cook 15 to 20 minutes or until steak is cooked through. Warm tortillas in the microwave. Top with steak mixture, divided eight ways.